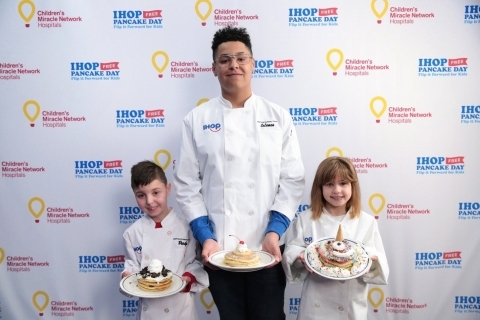 Partnering with Children’s Miracle Network Hospitals, IHOP Selects Three Junior Chefs to Kick Off a $4 Million Fundraising Campaign for Local Children’s Hospitals and Health Charities Across the U.S.
GLENDALE, Calif.--(BUSINESS WIRE)--Jan. 30, 2019-- Today, IHOP® Restaurants announced the 2019 date and a new name for its annual pancake giveaway. This year’s IHOP Free Pancake Day – Flip it Forward for Kids event will take place at IHOP restaurants nationwide on Tuesday, March 12 from 7:00 a.m. to 7:00 p.m. with select locations participating until 10:00 p.m.* For one day only, guests can get a free short stack of Original Buttermilk pancakes and, in return, help kids fighting to overcome illnesses by donating to its charity partners, Children’s Miracle Network Hospitals (CMN Hospitals), The Leukemia & Lymphoma Society, and Shriners Hospitals for Children. Coleman Giles, Manhattan Beach, Calif. Born with cardiomyopathy, Coleman underwent a heart transplant at Children’s Hospital Los Angeles at the age of seven. While waiting for his new heart, he went into cardiac arrest and relied on the Berlin Heart, an artificial heart pump to survive. Today, Coleman is 15 years old and thriving. Coleman’s pancake idea – The Hawaiian Luau – has banana slices baked into buttermilk pancakes before being topped with a grilled pineapple ring, whipped topping, a cherry, sprinkled with shredded coconut and, the most special part, his Grandpa Bob’s vanilla syrup. Brody Simoncini, Worcester, Mass. Six-year-old Brody wasborn with an abdominal wall defect that caused most of his organs to be on the outside of his body. Treated at Boston Children’s Hospital, he underwent multiple lifesaving surgeries over the course of five years, including open heart surgery and an induced coma to move his organs back inside the stomach. Today, he’s a healthy, active first-grader. Brody created OREO® Oh My Goodness, a stack of two buttermilk pancakes with OREO cookie pieces baked in and topped with vanilla icing and more cookie pieces. Visiting any IHOP restaurant on Tuesday, March 12, 2019 during event hours* to enjoy a free stack of IHOP’s world-famous Original Buttermilk pancakes and donating to the featured charity. Contact media@ihop.com to coordinate IHOP or charity spokesperson interviews, request gift card requests for audience giveaways, arrange an in-studio pancake demonstration, or coordinate a remote live-feed from an IHOP location. * Limit one offer per guest. One free short stack of Buttermilk Pancakes on March 12, 2019 from 7 a.m. – 7 p.m.; participating restaurants and hours may vary. Check with your local IHOP restaurant for details. Dine-in only. ** Issuance and redemption of coupons at participating restaurants only. Redemption expires Sunday, March 31, 2019 unless otherwise stated. For 60 years, IHOP has been a leader, innovator and expert in all things breakfast, any time of day. The chain offers 65 different signature, fresh, made-to-order breakfast options, a wide selection of popular lunch and dinner items as well as meals under 600 calories. IHOP restaurants offer guests an affordable, everyday dining experience with warm and friendly service. Today, there are more than 1,800 IHOP restaurants around the world, including restaurants in all 50 states and the District of Columbia, Puerto Rico and Guam as well as Canada, Mexico, Guatemala, Panama, Lebanon, the Kingdom of Saudi Arabia, Kuwait, the United Arab Emirates, Bahrain, Qatar, Thailand and India. IHOP restaurants are franchised by affiliates of Glendale, Calif.-based Dine Brands Global, Inc. (NYSE: DIN). The Leukemia & Lymphoma Society® (LLS) is the world's largest voluntary health agency dedicated to blood cancer. The LLS mission: Cure leukemia, lymphoma, multiple myeloma, and improve the quality of life of patients and their families. LLS funds lifesaving blood cancer research around the world, provides free information and support services, and is the voice for all blood cancer patients seeking access to quality, affordable, coordinated care. Founded in 1949 and headquartered in Rye Brook, NY, LLS has chapters throughout the United States and Canada. To learn more, visit www.LLS.org. Patients should contact the Information Resource Center at (800) 955-4572, Monday through Friday, 9 a.m. to 9 p.m. ET. Shriners Hospitals for Children is a system of 22 health care facilities dedicated to improving the lives of children by providing specialty pediatric care, innovative research and outstanding teaching programs. Children up to the age of 18 with orthopaedic conditions, burns, spinal cord injuries and cleft lip and palate are eligible for admission and receive all care in a family-centered environment regardless of the families' ability to pay. For more information visit: www.shrinershospitalsforchildren.org. Oreo® and the Oreo Wafer Design are registered trademarks of Mondelez International Group.